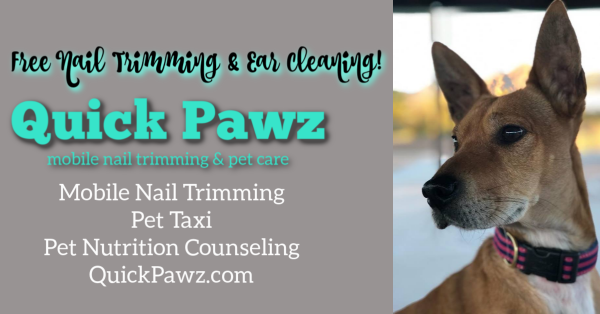 Quick Pawz offers a STRESS FREE Mobile Nail Trimming Service, Pet Sitting, Pet Taxi and Pet Nutrition Plans through pawTree. VALLEY WIDE APPOINTMENTS. We will have Expo only discounts for booking your Mobile Nail Trimming Appointment. Come by our booth and check it out!! FREE Ear Cleaning and Nail Trimming on site. Contests/ Raffles for a FREE Mobile Nail Trimming service for ONE PET valued at $30.00. Contest/ Raffle for $100.00 pawTree Pet Nutrition PRIZE PACK! MAKE SURE YOU VISIT OUR BOOTH!